How do you use an Activity System to improve accessibility to e-learning by students with disabilities? Visualizing actions between people, concepts and things requires more than words – models and metaphors are needed to create meaning. I will visualize connections on sheets of backing paper or a white board, or get out a box of Lego. Here I used Lewis chess pieces (resin replicas naturally) on a model of Engeström’s Activity System that I draw out on a piece of laminated board the size of a door (Engeström, 2008) in order to get a sense of people working in collaborative teams to a common goal and to understand that an Activity System doesn’t represent an entity so much as a framework or scaffold that is held together by the energy of action. The use of vocabulary is inevitable, though talking this through to an audience would be my preferred approach, so that with engagement response is invited. The models used here, from Vygotsky (1978) and Leon’tev (1978) to Engeström (2008) may appear familiar and set – they are not. There is a group that likes to see everything ‘triangulated’ – diamonds and stars, though evident in the literature on education – maybe akin to complex rather than plain language. From models we move to various metaphors – and you are certain to have your own. While Engeström (2008:19) himself moves on to ideas of how a fungi grows, to ‘knotworking’ and fluid, organic representations. Do we use models so that we spend more time thinking through the problems related to efforts to achieve what we desire? Or is the model a product of this effort? There’s a point in the social sciences where a model may lose more readers than it converts – the perseverance is worth it. Why use an Activity System? Activity Systems derived from a century of analysis of the way people construct meaning (Vygotsky, 1978. Leon’tev, 1978) that later researchers applied not simply to how people think, but how groups of people act in collaborative ways (Engeström, 1987). There are two parts to an Activity System – upper and lower. The upper part is the triangle drawn to represent the interaction of Subject, Tools and Object. Engeström (1987) took a current model – that of Vygotsky (1978) and made it his own and has since offered a metaphor to explain it further. Historically this is where Vygotsky began in Moscow in the late 1920s (Fig.3) Engeström and others turned the experssion of Vygotsky’s model the other way up. This split of upper and lower serves another purpose – Yrjö Engeström likens this expression of an activity system to an iceberg where the top triangle – Subject – Tools – Object is what we see, while the other actions, that give the system context – he added when developing Vygostky’s (1978) original model, are beneath the surface. Engeström. (2008:89). (Fig.4) It’s worth remembering that Vygotsky was working on how people create meaning, while later thinkers have adapted this to help scrutinise how communities or groups of people, tools and sets of guidelines create (as Engeström puts it above, ‘sense meaning’ Engeström 1987). Here the author Jane Seale (2006) takes an Activity System and applies it, as a management consultant might, to a humdinger of a problem. What this reveals is the interdependence of many factors, groups, tools, artifacts and interests on a desired objective. When is the construction of an Activity System useful? Engeström (2008:27) suggests that it is particularly useful ‘when one wants to make sense of systemic factors behind seemingly individual and accidental disturbances, deviations, and innovations occurring in daily practices of workplaces’. Someone needs to think it is necessary to study the status quo – perhaps because there is an awareness that something, somewhere is going wrong, or that there has been an actual downturn in business or collapse in profitability, or a desire simply to look at things in a different way to understand where improvements can be made, a change in policy and law, or a reinvented or renewed. Fig. 7. 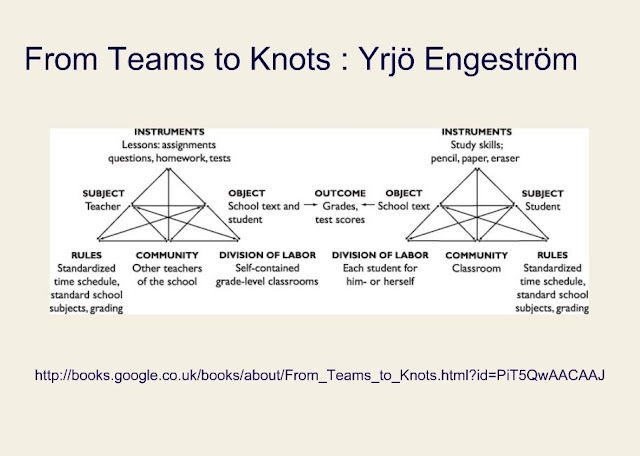 Engeström.Y (2008) From Teams to Knots: Activity-theoretical studies of Collaboration and Learning at Work. Engeström (2008:207) suggests that there are five principles in relation to theories of activity systems. The Object is a problem, the purpose, the motivation and opportunity – the modus operandi behind the activity. ‘Object orientation’ (Engeström 2008:222) is a crucial prerequisite of working with an activity system. In the context of accessible e-learning Seale (2006:165) creates an Activity System in which the object(ive) is ‘to make e-learning accessible for disabled students’. As an exercise considering its widest application this object definition suffers because the object is so broad it embraces a myriad of issues and circumstances, each word is open to interpretation – what, for example, is meant by ‘e-learning’, what is meant by ‘accessible’ by ‘disabled’ and by ‘student’. Rather than an object as an opportunity or goal as Seale uses, a fix, the desired outcome, is more likely to be found where, at least in the first instance, we identify a particular context and a tightly defined problem. Not only that, but to contain the likelihood of ‘ruptures’ across the activity system clarity and agreement is required on the problem that needs to be fixed. In relation to accessibility to e-learning for students with disabilities there are multiple problems, many unique to a student with a particular disability or, where feasible and appropriate, a group that can be identified by the nature of their disability, for example, deaf students who are seen as, and many want to see themselves as a ‘minority language’ group. What is more, a disabled student may have several impairments and the degree to which these are a barrier to e-learning is fluid, perhaps ameliorating with treatment, or getting worse, transmogrifying, or simply being intermittent. As these are known issues that would cause problems or clashes within the activity system and prevent its working it seems futile to build an activity system on this basis – knowing that it will fail. This may be an aphorism, but it rings true. Problem scoping is necessary but where a problem remains elusive, or is ‘messy’ rather than ‘tame’ (Rittel and Webber’s 1973, Ackoff 1979, Ritchey 2011) a variety of creative problem solving techniques (VanGundy, 1988. Griggs, 1985). Knowing what the problem is enables innovation – identifying the problem and devising a fix, and in communications, where, for example, advertisers prepare a creative brief that begins by clearly identifying the problem. Tools might be evaluation and repair tools and assistive technologies, software or legislation, guidelines or staff development. Tools are a mediating factor between the Subject (student, lecturer, facilitator of the desire outcome) and the Object – the purpose of all this activity. Tools play a significant role in the history of tackling accessibility issues, to undue, out do or transform resources or interpret platforms in a way that communicates their meaning offering some if not all the affordances of the tools as designed for students, who, having gained a place to study a degree in Higher Education might be thought of as some the most able’, not simply the ‘able’.Tools in this role at the apex of the Activity System and can include guidelines and legislation where they are an applied ‘tool’ rather than a rule or standard. ‘ A functioning tool for the analysis of teams and organisations’. Engeström (2008:229) Of course the category includes evaluation and repair tools, assistive technologies and software and equipment. Tools ‘mediate’ between the Subject – the facilitator of change through activity and the outcome of the activities – the Object. ‘To build a website that complies to level AAA’ may be achievable whilst ‘to make e-learning accessible for disabled students’ Seale (2006:) sounds like wishful thinking, rather ‘to build an e-learning module that when scrutinised by a representative range of people with dyslexia’ receives a grading of ‘satisfactory’ or above’. This would suggest the involvement therefore of dyslexic students in the testing of a navigation interface for the virtual learning environment as an ‘action’ between subject and object. How do you choose from amongst such a plethora of tools? This is what activity looks like in a group – evidence of several thousand recorded actions within a group of students (as subject), including the group tutor, and course chair; the Open University Virtual Learning Environment, computer, device, software and network link some of the tools; the rules set by the context of postgraduate e-learning with this institution, the community all those who can be reached online the division of labour the roles we all take as students, mentors, teachers and tutors, technical help desk, subject matter expert, novice or guru – the subject specific learning outcomes for each block, for each assignment or the goal of completing the module with a pass or distinction. The links between each component – object, tool, subject and so on – should equate to a burst of electricity or perhaps a chemical induced response between a synapse and a neuron – Engeström (2008) goes as far as to liken an activity system to a type of fungi – mycorrhizae like formation Engeström (1997). An Activity System should be seen not as a concept of a static entity, but rather a living and growing thing. The actions, the double-arrows between each concept, are what gives an activity system structure – it’s the management of the disturbances, contradictions and conflicts along these lines of action that disturb effective flow where the role of an activity system comes in – identify then fix these and you move towards achieving the object orientation or outcome. Knorr-Cetina (2003) talks of ‘flow architecture’ and if neither of these concepts ring true for you in relation to activity systems then Zerubavel (1997) talks of ‘a mindscape’ while Cussins (1992) talks of ‘cogntive trails’. There is a caveat when using a metaphor – we tend to look for similarities, rather than see the differences and a choice of metaphor will itself skew our thinking. Morgan (1986/1997). I would have opted for Subject as the third issue, but reading Engeström made me think again. Subject, Tools, Object reduces the Activity System to the far simpler upturned triangle Vygotsky devised to explain how people create meaning (Vygotsky, 1978:86) without further thought to the deeper and wider issues once learning is put in context, that Engeström (1987, 2008, 2011) added by broadening this way of showing how ‘meaning is created’ in the workplace by adding Rules, Community and Division of Labour. Rather than picking one more of these concepts at the expense of leaving the others out I think that the ‘Actions’ the double arrows that indicate something happening between the elements is of interest. I believe this would be the fourth of Engeström’s five principles – Contradictions and deviations as source of change. This after all is, literally, where all the ‘action’ takes place, what Seale (2006:164) describes as ‘problems, ruptures, breakdowns or clashes’. (I need to go back and to understand what is meant by Engeström’s third principle – ‘Mutual constitution of actions and activity’) I think this is the principle that the Activity System has to be seen as a complete, self-contained entity, that any break or failure or misunderstanding in the system would call it to fail so you’d be better of starting again from scratch until the scale or context works. Engeström uses the metaphor of a very particular kind of lichen (‘mycorrhizae’, Engeström, 2008:229) to describe Activity Systems – he doesn’t suggest however that you attempt to work with this kind of complexity, rather it is a reminder that an activity system is fluid and changing and depends on activity taking places between the defined nodes. Fig. 12. A discontinuous series of Activity Systems … like Toblerone at Christmas. By definition here the ‘non-disabled’, particularly in the cognitive sense though sometimes with athletic promise too. Ironically whilst ‘non-disabled’ is not a favoured term it does at least relate to a homogenous group, while ‘disabled’ does not given the range, scale and potentially shifting nature of impairments to learning from hearing, to visual, cognitive and mobility. Subject to be of most importance – this is the person, actor or lecturer, indeed a student – anyone who is responsible for facilitating and supporting the student’s learning experience. This may be a practitioner who works with a Higher Education Learning Technologist or the digital media access group if there is such a thing. Engeström (2008:222). Any of the team members may be a novice, which may be a positive or negative influence for the actions in the system. A novice is inexpert, on the other hand they are free from the habits that may be causing problems and creating barriers. Because of the way a novice learns they are more inclined to innovate as they are not bound or even aware to rules, guidelines and beliefs that may hold them back. These can be formal, informal or technical rules. They are institutional and departmental policies and strategies. These are rules of practice, and legislation, as well as strategies and research. They are explicit and implicit norms. These are conventions and social relations. These in the context of accessible e-learning are the various guidelines related to web usability and legislation related to accessibility and equality. Universal Design and User Centred Design are rules too. Rules mediate between the subject and the community. The actions, the ‘doing in order to transform something’ or ‘doing with a purpose’ are the activities that link Rules with Subject, Rules with Object and Rules with Community. These are ‘people who share the same objective’ – their being in this activity system is dependent on their wishing to engage with the object, the opportunity, to strive to achieve the stated outcome. Any ruptures are therefore not a consequence of having the wrong person in this community – this grouping, this loose gathering of like-minded people, is what Engeström has come to describe as a knot and the actions these people take as ‘knotworking’ Engeström (2008:194) – latent, informal, sometimes impromptu gatherings of people who assemble to address a problem or to take an opportunity – what Rheingold (2002) describes as ‘smart mobs’. This concept, or node as an ethereal entity is ‘how people are organized to realise the object’. Not one to represent by a chess piece and one may think that this ought to be the link that joins people together … this is where working with a model as the beat of a heart, not the heart itself, requires acceptance of the way a model is designed to work. Division of labor This is planning and funding, designing and developing, implementing and evaluating, using, specialists vs. the mainstream). Fig.17. A Wordle using the text from this blog. Fig. 18. The Water Cycle – imagine this reversionsed to represent a digital ocean and content in the ‘cloud’. 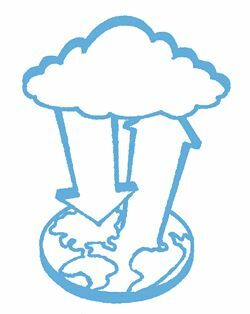 Digitization of assets is akin to the creation of an ocean in which the binary code are the molecules of water – apt then with the shift from Web 1.0 to Web 2.0 and our adopting the use of ‘the Cloud’ and ‘Cloud Computing’ to take this metaphor into a more dynamic form and think of it as a water-cycle. This system is shifting continually horizontally with currents and tides, but also vertically – the exponential growth in computing speeds and memory capacities the energy that drives the system. This global system hasn’t taken adequate account of people with disabilities – as in the real world there are barriers to access caused by visual, hearing, mobility and cognitive impairments – just as these have been addressed in a piecemeal way through legislation, funding, programmes and promotions, by disability groups or holistically, so too with adaptations or changes to the digital world – there is no panacea that will remove all barriers for all people with any disability, of any kind, type or stage of deterioration or amelioration. Stretching the metaphor further I wonder if at times this digital water-cycle, again like the real one, is polluted, that translucence as well as flotsam and jetsam in this ocean are the barriers – on the one hand the pollutants have to be removed – the barriers taken down – but at the same time, cleaner purer water, in the form a universal design that is simpler and usable would gradually cleanse some of system. Once again, a mirror to the real world responses, specialist schools and associations, say for those with dyslexia are blind or deaf, become an oasis or island in this digital system. Cole, M. and Engeström, Y. (1993) A cultural-historical approach to distributed cognition, in: G. Salomon (Ed. ), Distributed cognitions: Psychological and educational considerations (New York, Cambridge University Press), 1-46. Conole, G. and Oliver, M. (eds) 2007 Contemporary Perspectives on E-learning Research, Themes, Tensions and Impacts on Research. London, RoutledgeFalmer. Cussins, A. (1992). Content, embodiment and objectivity: The theory of cognitive trails. Mind, 101, 651–688. Engestrom (2008-04-30). From Teams to Knots (Learning in Doing: Social, Cognitive and Computational Perspectives) (p. 238). Cambridge University Press. Kindle Edition. Engeström, Y. (1987) Learning by Expanding: An Activity-theoretical Approach to Developmental Research. Helsinki: Orienta-Konsultit. development in a network of organizational learning. In T. Kauppinen & M. Lahtonen (Eds.) Action research in Finland. Helsinki: Ministry of Labour. Knorr-Cetina, K. (2003). From pipes to scopes: The flow architecture of financial markets. Distinktion, 7, 7–23. Kuutti, K. (1996) Activity theory as a potential framework for human–computer interaction research. In B. Nardi (ed.) Context and Consciousness: Activity Theory and Human–Computer Interaction. Cambridge, MA: The MIT Press, pp. 17–44. Leon’tev.A.N. (1978) Activity, consciousness, and personality. Englewood Cliffs. NJ. Prentice-Hall. Phipps, L., Witt, N. and Kelly, B. (2005) Towards a pragmatic framework for accessible e-learning. Ariadne, 44. Online. Available HTTP: <http://www.ariadne.ac.uk/ issue44/ phipps/> (last accessed 19 Dec 2012). Rheingold, H. (2002). Smart mobs: The next social revolution. Cambridge, MA: Perseus. Ritchey, T. (2011) Wicked Problems – Social Messes: Decision support Modelling with Morphological Analysis.Springer. Vygotsky.L.S. (1978) Mind in Society. The development of higher psychological process. Cambridge. MA. The way we learn hasn’t changed in a generation, not in centuries or even millenia – natural selection doesn’t work like that, we are still hunter gatherers on the plains of Eastern Africa. Our imagination, our struggle in adversity, has brought us a long way though. The tools we use to learn have changed more so in the last decade than at any other time in several centuries – eBooks are replacing print and our classroom has virtual walls and may comprise several thousand minds … and can be as intimate as you and a leading academic you stumble upon. If a place of learning is a garden and a classroom a raised bed, then perhaps the way we should look at connected Web 2.0 learners is more akin to rows of strawberries. Fig. 1. The Open University’s Masters in Open and Distance Education (MAODE). Expressed as a Wordle. A personal collection of key influencers based on those tagged in this blog. Includes my own reading and indulgences. On Friday, at midday, my ou student blog reached a significant milestone. I’ve been at it for 33 months. I’ve blogged the best part of FIVE modules now – most of which required or invited some use of the blog platform (or another). It required little encouragement – I used to keep a diary and have found since 1999 that in their digital form they are an extraordinarily versatile way to gather, consider, share and develop ideas. The investment in time, on average, an hour a day in addition to – though sometimes instead of coursework over 1000+ days. To mark this event, and as I need to go through this online diary, this e-journal, this ‘web-log’ (as they were also once momentarily called) ahead of some exciting meetings coming up next week I thought a simple task might be to click through the tags to identify who have been the key influencers in my reading and thinking over the last two and a half years. Fig.2. Another way of looking at it. Betham, Conole and Weller are key MOADE authors from the Open University. John Seely Brown is a vital undercurrent, Engestrom one of several enthusiasms like Vygostky. While Gagne, second hand hardback, needs to be on your desk for frequent reference. What I thought would take an hour has taken nearly 40 hours. Clicking on a tag opens a corner of my head, the notes take me back to that day, that week, that assignment or task. It also takes me back to the discussions, resources and papers. And when I find an error the proof-reader in me has to fix. Aptly, as we approach November 5th, and living in Lewes where there are marches and fireworks from late October for a couple of weeks peaking of course all evening on the 5th, my head feels as if someone has accidentally set light to a box of assorted fireworks. Just as well. Meetings these days are like a viva voce with eager ears and probing questions – they want the content of my mind and whatever else I bring to the subject after thirty years in corporate training and communications. Fig. 3. Wordle allows you to say how many words you want to include in the mix. To create weight I had to repeat the names I consider most important twice, three or four times in the list. I also removed first names as these would scattered into the mix independently like peppercorns in a pan of vegetable stock. List all authors who have been part of my learning and thinking over the last couple of years. Include authors that my antennae have picked up that are relevant to my interest in learning, design, the moving image and the english language. Fig.4. This even makes the key protagonists look like an advertising agency Gagne, Beetham, Conole and Weller. I can never finish. Take this morning. I stumble upon my notes on three case studies on the use of e-portfolios from H807 which I covered from February 2010-September 2010. To begin with I feel compelled to correct the referencing in order to understand the value, pertinence and good manners (let alone the legal duty) to cite things correctly. (Even though this post was locked – a ‘private’ dump of grabs and my thoughts). Then I add an image or two. These days I feel a post requires a visual expression of its contents to open and benefits from whatever other diagrams, charts or images you can conjure from your mind or a Google Search – ‘the word’ + images creative commons – is how I play it. Fig. 5. From David Oglivy’s book ‘Ogilvy on advertising’ – a simple suggestion – a striking image, a pertinent headline and always caption the picture. Then write your body copy. A background in advertising has something to do with this and the influence of David Ogilvy. I spend over two hours on the first of three case studies in just one single post. At the time I rubbished e-portfolios. The notes and references are there. Tapped back in I can now make something of it. A second time round the terms, the ideas – even some of the authors are familiar. It makes for an easier and relevant read. What is more, it is current and pertinent. A blog can be a portfolio – indeed this is what I’d recommend. From time to time I will have to emerge from this tramp through the jungle of my MAODE mind. Not least to work, to sleep, to cook and play. Along the way this behaviour, these actions, me being me, has found me working at the Open University for a year, and then at Lumesse a global corporate e-learning company. In the last month two international organisations have had me in, in the last week four more have been in touch online including interest from Australia, France and North America. Next week a magical triad may occur when I broker a collaboration between two of them with me holding their respective hands to initiate a project. There could be no better validation for the quality, depth, impact and life-changing consequences of seeing this OU degree through. The Open University’s Masters in Open and Distance Education (MAODE). November 2, 2012 6:56 am / 1 Comment on The Open University’s Masters in Open and Distance Education (MAODE). I’ve been at it for 33 months. I’ve blogged the best part of FIVE modules now – most of which required or invited some use of the blog platform (or another). I required little encouragement – I used to keep a diary and have found since 1999 that in their digital form they are an extraordinarily versatile way to gather, consider, share and develop ideas. Fig.2. Another way of looking at it. Beetham, Conole and Weller are key MAODE authors from the Open University. John Seely Brown is a vital undercurrent, Engestrom one of several enthusiasms like Vygostky. While Gagne, second hand hardback, needs to be on your desk for frequent reference. Fig. 3. Wordle allows you to say how many words you want to include in the mix. To create weight I had to repeat the names I consider most important twice, three or four times in the list. I also removed first names as Wordle would have scattered these into the mix independently like peppercorns in a pan of vegetable stock. Fig.4. This even makes three of the key protagonists look like an advertising agency Gagne, Beetham and Conole. These days I feel a post requires a visual experssion of its contents to open and benefits from whatever other diagrams, charts or images you can conjure from your mind or a Google Search – ‘the word’ + images creative commons – is how I play it. Fig. 5. From David Oglivy’s book ‘Ogilvy on advertising‘ – a simple suggestion – a striking image, a pertinent headline and always caption the picture. Then write your body copy. There can be no better recommendation to read a book than when its author spots you as a like mind and invites you to read. 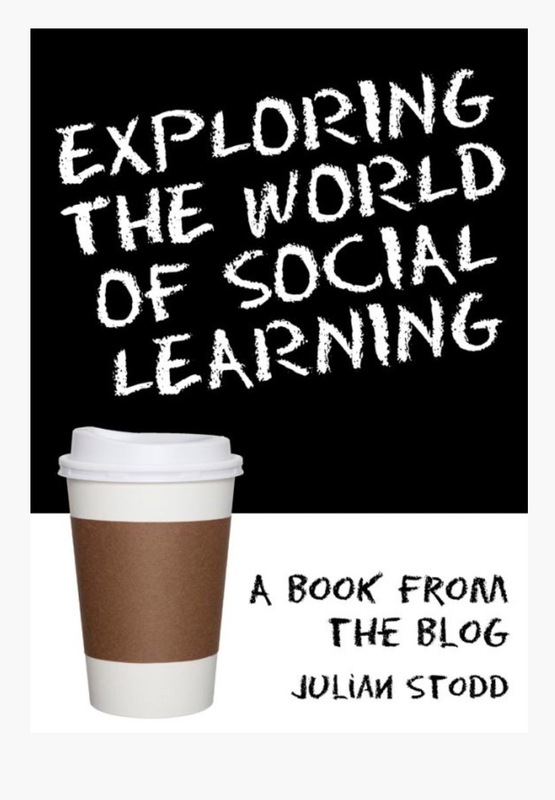 I am halfway through Julian Stodd’s ‘Exploring the World of Social Learning’ and am keen to spread the word now so that a community of us have something to discuss and share. I should add a grab here of the couple of dozen books I have read in, on and around ‘social learning’ as I put ‘Exploring the World of Social Learning’ alongside Martin Weller’s ‘The Digital Scholar’, ‘A New Culture of Learning’ Douglas Thomson and John Seely Brown, ‘From Teams to Knots’ Yrjö Engeström and ‘The Now Revolution’ Jay Baer and Amber Naslund via a solid grounding in educational theory that you’d get from Vygotsky’s ‘Educational Psycology’. An intelligent, engaging and practical read that though linear in format – it’s a book afterall – has built into it moments to reflect, explore or do. I should draw a Venn Diagram made up of three fields: Corporate L&D, Contemporary Theories of Learning and Web 2.0 Social Spaces as ‘Exploring the World of Social Learning’ touched on all three. There is more, which makes it so readable, there are stories that draw you in that intrigue – while you get a sense of who the author is too, just as you get when reading Bill Bryson. Better than a set of academic papers, that by definition are several years out of date and sometimes a heavy read encumberred by references – and better than the inevitable Dummies Guide to Social Learning, which is certain to appear momentarily because ‘Exploring the World of Social Learning’ has a narrative flow – it is readable, the Dummy guides are not. Effective online interaction – a mixed bag. Some do, some don’t. Some will, some won’t. Notes from Thorpe, M. (2008) ‘Effective online interaction: mapping course design to bridge from research to practice’, Australasian Journal of Educational Technology, vol.24, no.1, pp.57–72. What does it take to create, manage and maintain effective online interaction as part of a learning experience? Research on the design would reveal more an alternative pedagogies. Insufficient understanding of the learning context. Distinct kinds of interaction need to be studied. Hirumi’s (2002) describes the taxonomy of interaction types, she noted that ‘other types of interactivity… were minimally represented in the review, including learner-instruction and most learner-non-human types of interaction (learner-content, learner-interface, and learner-environment’. Haythornthwaite (2006) says that it is necessary to understand the context of implementation and that such a diversity of computer-mediated approaches are possible. knowledge application vs. knowledge construction. Increasingly the variety of entry points, familiarity with your own tools and software, and the indulgence of your own ways of doing things, let alone experience of various platforms, suggests that people want to, and expect to learn in a way that suits them, that is personal and fragmented. What matters to them is reaching their learning objective, which in itself will be their own interpretation of the set learning outcomes. The learning design intended to deliver these different forms of interaction will involve decisions about type and timing of learning tasks, structured or less structured task management, locus of control and duration of the interaction. Littleton & Hakkinen (1999) highlight the developments in research from Piagetian cognitive constructivism, through the social constructivism inspired by Vygotsky‘s work, to cultural psychology (situated learning). Each perspective has emphasised key features of interaction, such as perspective differences and socio-cognitive conflict between collaborating pairs, the content of discourse, particularly the degree to which argumentation and justifications are involved, and the powerful influence of social representations of self and others. A learning community that is no longer set within water- tight institutional barriers. An obligation that may counter the flexibility otherwise provided. Our overall aim is to provide you with the skills needed to develop your own environmental literacy and to take part in informed environmental debate and action, rather than to expand your environmental knowledge as such. (Course introduction). i.e. The tools and opportunities to acquire knowledge but not the course content itself. No tutorials, one day school and lots of interaction online. Retention is 10% up on other courses. In 2005, 75.5% of all students who started the course achieved a credit, the highest percentage on this indicator for any level 3 course in the Science Faculty. Students’ responses showed that the course successfully requires them to apply understanding in completing the assignments and to develop higher level skills, in particular problem solving and team work. These relate to key aims for the course as a whole. The course meets the most demanding test in terms of retention and successful completion of assessment requirements. All tutors picked out aspects associated with interpersonal interaction, with three tutors commenting on the conferencing, the high rate of participation and continuity of student contact with peers as well as the tutor. Tutors also highlighted the beginning of the course as key to its success. The first six weeks of the course focus on a learning activity which feeds into an online debate and culminates in a day school. The support comes as much from other students, they felt, as from tutors, with accessibility to online help being available at most times of the day and evening. This student identified task clarity as key to being able to ‘project themselves socially and emotionally’ (Rourke et al, 2001, p.3) and to make effective contributions from the beginning. High levels of interest and involvement. Compendium mapping (a course design software tool developed by the Open University) creates a single ‘view’ of all the elements involved in the sequence, such as the input from the tutor that is required, and the role of resources and outputs in achieving the final result. Bringing together all these aspects into one ‘view’ enables the practitioner to get an overview of what Littleton and Hakkinen refer to as a ‘systemic whole’ – the many factors that together construct a collaborative learning environment. This kind of narrative detail is helpful in making judgements about what from a particular case might be adapted or applied elsewhere (Yin, 2003). In communicating the outcome of research to teaching staff, it has been essential to use both a narrative and a visual representation (as in Figure 1) to clarify the contextual factors and pedagogical practices associated with, in this case, positive outcomes from a particular technology in use! Alexander’s framework of a pattern language. One element in the pattern framework is to identify the problem for which the design offers a solution. Alexander, C. (1979). The Timeless Way of Building. New York. OUP. Bannan-Ritland, B. (2002). Computer-mediated communication, elearning and interactivity: A review of the research. Quarterly Review of Distance Education, 3(2), 161-179. Conole, G., Thorpe, M., Weller, M., Wilson, P., Nixon, S. & Grace, P.(2007). Capturing practice and scaffolding learning design. Paper presented at the EDEN annual conference 2007 New Learning 2.0? Naples, June 2007. Goodyear, P., Banks, S., Hodgson, V. & McConnell, D. (2004). Research on networked learning: Aims and approaches. In P. Goodyear, S. Banks, V. Hodgson & D. McConnell (Eds), Advances in research on networked learning. Dordrecht: Kluwer Academic Publishers. Hirumi, A. (2002). A framework for analyzing, designing and sequencing planned elearning interactions. Quarterly Review of Distance Education, 3(2), 141-160. Littleton, K. & Hakkinen, P. (1999). Learning together: Understanding the processes of computer-based collaborative learning. In P. Dillenbourg (Ed), Collaborative learning: Cognitive and computational approaches. Oxford: Elsevier. Moore, M. G. (1989). Editorial: Three types of interaction. The American Journal of Distance Education, 3(2), 1-6. Ramsden, P. (1991). A performance indicator of teaching quality in higher education: The Course Experience Questionnaire. Studies in Higher Education, 16, 129-150. Rourke, L., Anderson, T. & Garrison, R. (2001). Assessing social presence in asynchronous text-based computer conferencing. Journal of Distance Education, 14(2), 1-16. Yin, R. K. (2003). Case study research: design and methods (3rd ed.). Thousand Oaks California: Sage Publications.